The Place When I visited Six Senses Duxton last month to check out the space, it is hard to imagine that Yellow Pot is a Chinese restaurant, also the only dining concept at the wellness property. The interior of Yellow Pot is anything but conventional, characterised by striking bolds of gold, yellow and black hues designed by acclaimed British designer Anousaka Hempel. The interior of Yellow Pot is relatively dim during dinner, which is unlike most other Chinese restaurants in Singapore where the interior is typically brighter and more oriental looking. In all senses, it is the first impression for me in terms of a more modern and innovative approach towards Chinese cuisine, similar to the modern vibes of Mitzo to some extent. The Food The philosophy of the dishes at Yellow Pot is balanced and healthful eating, in line with the ideology of Six Senses properties. That said, I can safely say that the flavours of the food are not compromised at all. For a start, the tea selections are pretty diverse, specially curated for Six Senses Duxton by Yixing Xuan Teahouse, a family run teahouse just around the property’s corner. I started with the Chilled Organic Vine-ripened Tomatoes (S$8), which is quite refreshing for a start especially with the “Li Hing” plum infusion. The Seared Pork Cheek (S$12) marinated with cumin, chilli and mango is very tender, sliced in chunky slices which I couldn’t resist reaching out for more. Chicken soup for the soul? The unique part about this Chicken Soup (S$12) is that comes with shimeji-stuffed tomatoes, along with a nourishing broth flavour prepared by simmering for three days with only chicken. On to the meats, I love the Roast Duck (S$32/half portion). 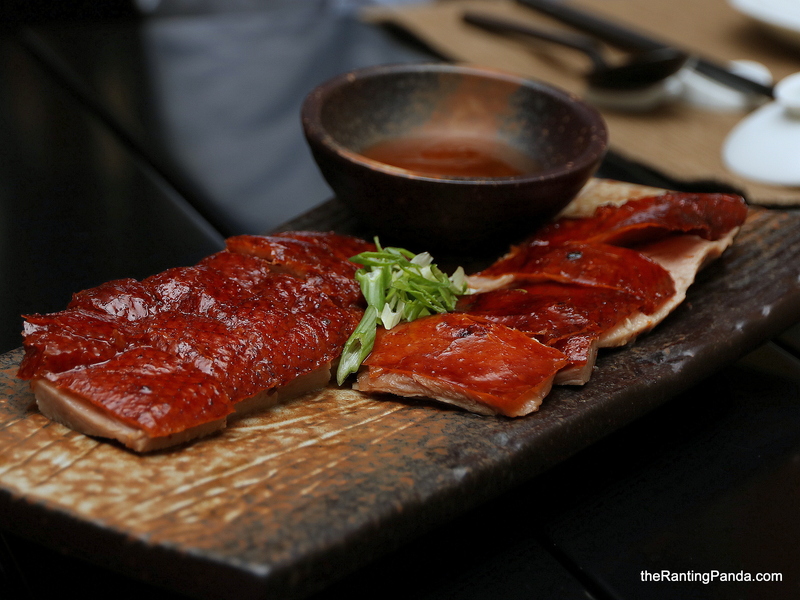 The skin is crispy, while the duck meat is very tender with a nice smoky aroma. To my surprise, the duck is sourced from Malaysia (which I initially thought is Irish duck) and is marinated for three days with fermented bean curd, before being roasted in the Apollo oven using hickory wood chips. This is a must try dish in my opinion. The other meat I enjoyed as much is the Wok-seared Organic Grass-Fed Beef Tenderloin (S$36), done medium-rare. The beef is fried with two types of peppercorn, crushed Tellicherry peppercorns and Sichuan peppercorns. The Sichuan peppercorns flavour, while subtle, works well in elevating the flavours of the beef. Be sure to have the beef with the crispy garlic. To balance the meats, the Braised White Cabbage (S$12) is a worthy dish to try. The cabbage is braised in housemade chicken stock, conpoy, wolfberries and Shaoxing wine. The Steamed Kühlbarra Barramundi (S$22) is a locally sourced fish, which is rather light in flavour even with the scallion-ginger pesto. That said, the freshness of the barramundi is evident. A dish which caught me by surprise is the Braised Sweet & Sour Eggplant (S$14) with assorted mushrooms. I am usually not too fond of eggplants but this version works for me because of the sweet and sour sauce, along with the hot bean paste which goes into it. I reckon it will be perfect with a bowl of white rice. Instead of rice, I had the Stir-fried Mee Sua (S$18), which looks more like a plate of fried bee hoon. That said, the flavours of this seemingly simple dish is robust with hints of wok-hei smoky flavours, along with the addition of tiger prawns and Hokkaido scallops. For dessert, I had the Lemongrass & Calamansi Jelly (S$8) with fresh fruits, something refreshing and light to conclude the meal is also always welcoming. Rants It’s not the most oriental looking Chinese restaurant around, if your folks prefer a more conventional dining ambience. Will I Return Again? I was initially sceptical about Yellow Pot as the vibe it exudes is nothing like a conventional Chinese restaurant. The dishes I tried are generally not heavily seasoned but suffice to say, they are enjoyable.